Somalia has been without a stable government since Mohamed Siad Barre's regime collapsed in 1991. (CNN) -- Hundreds of Somalis marched through the streets of Mogadishu, Somalia, on Monday, protesting against Al-Shabaab militants. The protesters -- mostly women and children, along with traditional warriors wearing white clothes and armed with spears and wooden shields -- chanted slogans denouncing the al Qaeda-inspired group. 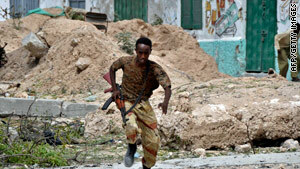 It was only the nation's second public demonstration against Al-Shabaab, which controls much of southern Somalia. It came a few days after the militant group destroyed tombs of revered Sufi clerics. The demonstration was staged in a government-controlled area of the city and was guarded by government forces, according to Yusuf Mohamed, who works for Shabelle Radio in Mogadishu. "People were really disturbed by the move of Al-Shabaab to destroy the tombs of the revered sheikhs of Ahlu Sunna" said Mohyadin Hassan Afrah, who leads a civil society umbrella group in Mogadishu. The protesters shouted slogans of support for the U.N.-backed government, observers said. Al-Shabaab follows the strict Saudi Arabian-inspired Wahhabi interpretation of Islam, rather than the Sufi Islam of many Somalis. "We call for a holy war against them," said Sheikh Abdulkadir Somow, from the Sufi Ahlu Sunnah Wal Jama group, which recently signed a deal with the government in neighboring Ethiopia. Some of the demonstrators carried posters with slogan such as "Down and defeat to Al-Shabaab," observers said. They also carried slogans to support the transitional government such as "Support Peace and Government." Last year, nearly 100 students came out in anger to the streets of Mogadishu in protest of Al-Shabaab after a suicide bomber detonated his explosives in a graduation ceremony in the capital, killing more than 20 people, including four government ministers, doctors, teachers, students and journalists.